I’ve recently been rereading Robert Skidelsky’s 1975 biography of Oswald Mosley. Robert Skidelsky* tells a tale the ancient Greeks would have recognized as tragedy in the strictest sense of the term, the story of a man of the rarest gifts brought shockingly low by his own insatiable vanity. To think that a man as talented and as dashing as Mosley should have welcomed Adolf Hitler as the guest of honor at his wedding and should almost single-handedly have conjured up a significant anti-Semitic movement in England is to realize that a man whose capacities are such that he might have become a very great historical figure may in the end make of himself an absolute jackass. What brought me back to the story of Mosley was a video that I saw on YouTube several weeks ago. It is Mosley’s November 1967 appearance on the David Frost Programme. In Mosley’s time, and indeed until quite recently, the ability to see hecklers off was an essential part of success in British political oratory. Mosley was apparently quite good at this from the beginning of his political career in the early 1920’s. After giving over 200 speeches a year throughout the 1930’s, encountering hecklers on the vast majority of those occasions, he was as good at handling hecklers as anyone could be. It was to Mosley’s advantage, then, that the audience was quite hostile to him (well, what audience wouldn’t have been, by that time?) It was an even greater advantage that the lead heckler, Solly Kaye, had been a frequent antagonist of Mosley’s in the 1930’s, so that Mosley knew exactly what to expect from him. After the showdown between Kaye and Mosley in the first half of the program, one rather has the uneasy feeling that Mosley is going to come out a clear winner. Frost appears to have felt that way, as he resorts to a rather frantic attempt to remind people that the amiable fellow sitting across from him is after all Oswald Mosley, leader of the British Union of Fascists and one of the undoubted villains of the century. In that interview, embedded below, Mosley executes what I think of as “the Mosley Shuffle.” At the 27 minute mark, Frost asks Mosley whether he thinks Hitler, if he had survived the war, ought to have been tried for and convicted of war crimes. Mosley says yes, that the killing of defenseless prisoners is a crime under any system of laws and so the murder of massive numbers of Jews in concentration camps should have brought Hitler and his top men into court. At the 28 minute mark, he throws in a curious aside about that particular mass murder: “while I don’t think nearly so many were killed as were supposed to be killed, that doesn’t matter- that doesn’t matter- because any crime, the killing of any defenseless prisoner, is a crime and everybody must detest it.” At the 33 minute mark, he acknowledges that 6 million Jews were killed in the Holocaust, then immediately blames Jews collectively for starting World War Two (“They made the greatest mistake they ever made when they produced that war,”) without which the Holocaust would not have been possible. I think I understand why Mosley would perform this unbecoming rhetorical box-step. He was still trying to revive his political career in 1967; in the previous year’s general election, he and two colleagues from his Union Movement stood for parliament, receiving an average of 3.7% of the vote. Mosley takes great pains in the last minutes of the program to ensure Frost repeats that figure correctly, then tells Frost that it is almost exactly double what the Nazi Party received in the German elections five years before Hitler came to power. That prompts Frost to ask if Mosley still expects someday to come to power, and the program ends before Mosley can finish his answer. Given his background, any revival of Mosley’s political prospects would have had to begin on the far right, with him consolidating their support, then expanding from that base to reach into the mainstream in a time of crisis. By the late 60’s, many activists on the far right busied themselves with Holocaust denial, so if Mosley were to reemerge as their leader he had to leave some space in his platform for that noxious pastime. On the other hand, people in general resent insults, and Holocaust denial is an aggressive insult to the intelligence of the average or even the quite substantially below-average voter. So it must have been difficult to imagine a movement that allowed itself to be widely identified with Holocaust denial could expand beyond the fringes under any circumstances. Therefore, Mosley could hope to reconnect with the mainstream only if he kept the denialists at arm’s length. Yesterday I stumbled upon some writings by a spiritual heir of Mosley’s, a man named David Cole. Mr Cole writes for Taki’s Magazine, an always-lively, rarely lovely far right publication. Taki’s is quite undiscriminating in one sense; anyone who can write amusingly is likely to be accepted as a contributor, no matter how scandalous his or her background may be. 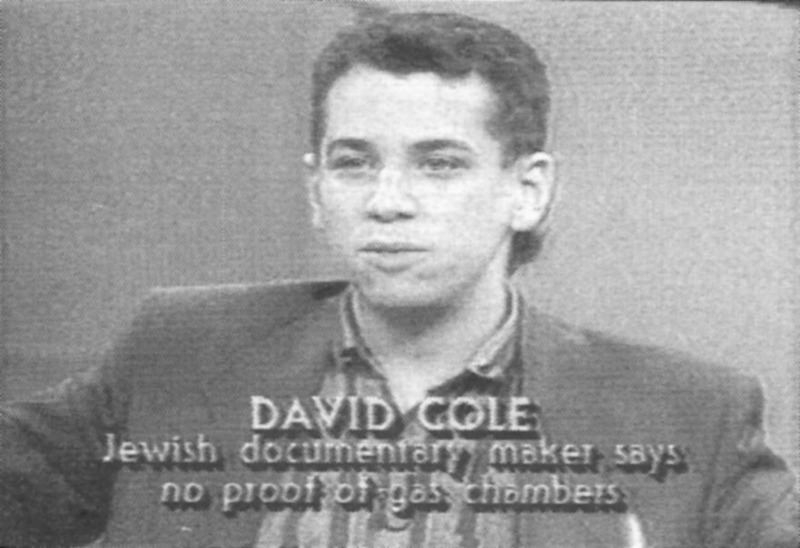 Mr Cole is a spectacular example of this; in 2013, after 15 years of working in Hollywood making Holocaust-related documentaries and promoting pro-Israel groups under the name “David Stein,” he was dramatically unmasked as a man who spent several years ending in the mid-1990s promoting a theory that the Holocaust ended in 1943, killing 4 million rather than 6 million Jews, none of them in gas chambers at Auschwitz. Mr Cole gives two reasons for his retirement from the field of Holocaust minimization. First, the 1995 Oklahoma City bombing made him think twice about the sort of people whose support he was attracting. And second, the Jewish Defense League offered a $25,000 bounty for his assassination. When “David Stein” was exposed as David Cole, Mr Cole said that he still believed the stuff he’d peddled back in the 90’s. If we can identify the motive behind Mosley’s box-step, what motivates Mr Cole to perform his wild tarantella? He doesn’t seem to have any master plan that will culminate in the building of a political force, as Mosley did. Mr Cole seems to be in search of a small-time racket, the equivalent of running a three-card Monte game on a street corner. Jewish Holocaust denier seems like a small niche, but I doubt there is much competition to fill it. The passive-aggressive approach of at once conceding, indeed forcefully arguing, that the Nazis murdered millions of Jews, then making rather less impressive arguments to depress the number of millions significantly below the generally accepted figure, may fit the idea that Mr Cole aspires to be a two-bit operator. While a highly ambitious figure like Mosley took care not to alienate any of the people he needed to achieve his [evil!] plan, Mr Cole seems to go out of his way to alienate as many people as he can. He is clearly an intelligent fellow, so presumably this means that his plan does not require the support of any particular person or any particular constituency. A three-card Monte dealer can get by with any two or three confederates to act as lookout and to lure marks in by pretending to be gamblers winning at the game, but a bigger time scam artist needs particular people and a large number of them. Perhaps that in turn explains why an intelligent man with Mr Cole’s apparent talent for self-promotion wants to become the equivalent of a three-card Monte dealer. He wants the independence they have. At a moment’s notice, the three-card Monte dealer can disappear into the night and set up again in a different location. That Mr Cole dropped out of sight and reinvented himself under an alias, playing another con game built around the same topic that underpinned his original dodge, sounds like something that a man would do who would rather be highly independent than have a broad scope of action. *Usually on this blog I refer to living people by courtesy titles or professional honorifics, but I find the British aristocracy so preposterous an anachronism that I cannot bring myself to call Robert Skidelsky “Lord Skidelsky.” Nor would I refer to Oswald Mosley by his title as “Sir Oswald Mosley, 6th Baronet of Ancoats.” Since Robert Skidelsky does have that title, though, I don’t think I can call him “Mr Skidelsky” or “Professor Skidelsky.” That’s why I’m stuck with his full name. **To the extent that Mr Cole associates with Mr Irving, he is a bit more than just a spiritual heir of Oswald Mosley. In 1961, as a student at University College London, Mr Irving seconded Oswald Mosley in a public debate about immigration. So Mr Cole appears to have an acquaintance in common with Mosley.